Yvonne Drage MAAT We would like to offer our congratulations to our Accounts Manager Yvonne who today found out that passed her AAT Accounting Technician Qualification exams. Well Done Yvonne! Bob Heil with W&S at National Hamfest! Come and meet Bob Heil, K9EID, founder of HeilSound at the National Hamfest at Newark with Waters & Stanton! Hear his microphones in action and listen to his mini lectures, LIVE on our stand. This is a W&S exclusive, Bob makes one of his rare visits to the UK bringing his demo gear with him. You will also get a personal signed commemorative QSL card and the opportunity to take advantage of special deals on the day. Taiwanese Visitor Today we had a visitor all the way from Taiwan. Eshuie is on holiday, staying in London and made a special trip to Hockley to visit us. 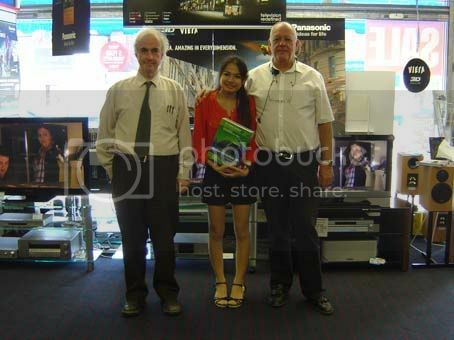 While here she bought an Airnav RadarBox-3D, she is pictured below with Peter Hall (left) and Roy Britt (right).